Line from the film: "Eh love, show us your personality!" 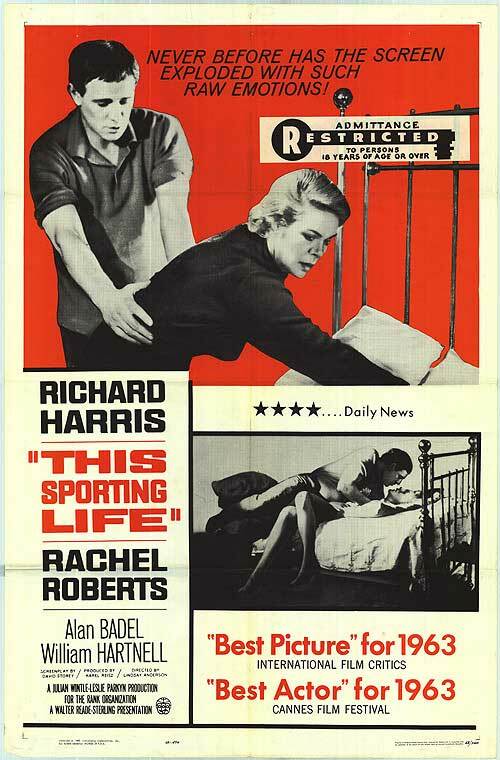 This Sporting Life marked the first time that Richard Harris played a lead role in a motion picture, but based on his bravura performance you would never know it. Harris looms heavy over each and every scene in this film, portraying a brute of a man who falls deeply in love with a woman, yet has no idea how to express his feelings for her. Coal miner Frank Machin (Harris) believes he has the makings of a star rugby player. To prove it, he picks a fight with several guys on the local club, and his tenacity so impresses the team’s co-owner Gerald Weaver (Alan Badel) that Frank is given a chance to prove himself on the playing field. To everyone’s surprise, Frank plays brilliantly, and his performance even earns him a brief mention in the newspaper. His rugged persona is such a perfect fit for the sport that Weaver and his partner, Charles Slomer (Arthur Lowe) agree to Frank’s outrageous terms (he demands a thousand pounds as a signing bonus). Game after game, Frank continues to shine, and before long he’s one of the most popular personalities in the entire city. Unfortunately, the only person not impressed by Frank's on-field antics is the one he cares most about: his widowed landlady Margaret Hammond (Rachel Roberts). Still recovering from the untimely death of her husband a few years earlier, Margaret resists Frank’s advances, and refuses to accept the expensive gifts he buys her. Over time, Frank manages to wear Margaret down, and she finds that she, too, cares deeply for him. But can a guy like Frank hold onto a woman as delicate as Margaret, or will his rough demeanor push her away for good? As with Tony Richardson’s The Loneliness of the Long Distance Runner, much of the story that makes up This Sporting Life is told via flashbacks; Frank recalls episodes from his recent past while undergoing dental surgery (to remove six teeth he broke during a recent match). Harris is a veritable dynamo in the movie’s early scenes, when his character is convinced he has the makings of a star rugby player. Even when the action shifts to the field of play, Harris’s Frank is as ornery as can be; when a teammate named Gower (Tom Glegg) refuses to pass him the ball, Frank punches him in the face, breaking his nose. Yet as exciting as these scenes are, the film’s most powerful sequences involve Frank’s attempts to first connect with Margaret, and then maintain his relationship with her. The problem is that Frank is a blunt instrument; one day, while she’s changing the linens in his room, Frank grabs Margaret from behind and kisses her; and later, when the two are a couple, she expresses her distaste for his extravagant spending, which makes her feel like a “kept” woman. How does Frank respond to Margaret's concerns? He slaps her across the face, then immediately tries to apologize. Roberts, who was so good as the married woman dating Albert Finney’s character in Saturday Night and Sunday Morning, delivers yet another strong performance in This Sporting Life, and this movie also marked the directorial debut of Lindsey Anderson, one of the formidable forces of the British New Wave movement. But from start to finish, this movie belongs to Richard Harris, whose searing portrayal of Frank Machin is as noteworthy as it is disturbing. In fact, I consider Frank Machin one of the all-time great cinematic brutes, right up there with Brando’s Stanley Kowalski (A Streetcar Named Desire) and DeNiro’s Jake LaMotta (Raging Bull). Yes, Harris is that good.